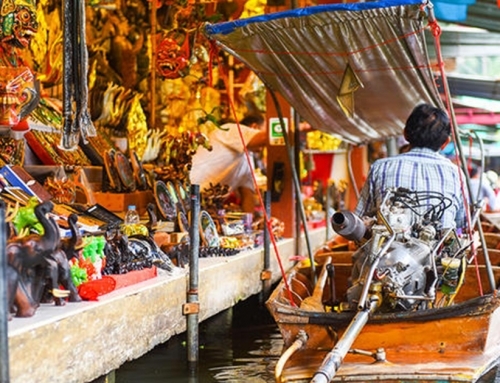 Although the Thai capital is a modern cosmopolitan city, most of Bangkok’s residents take their centuries-old traditions very seriously. 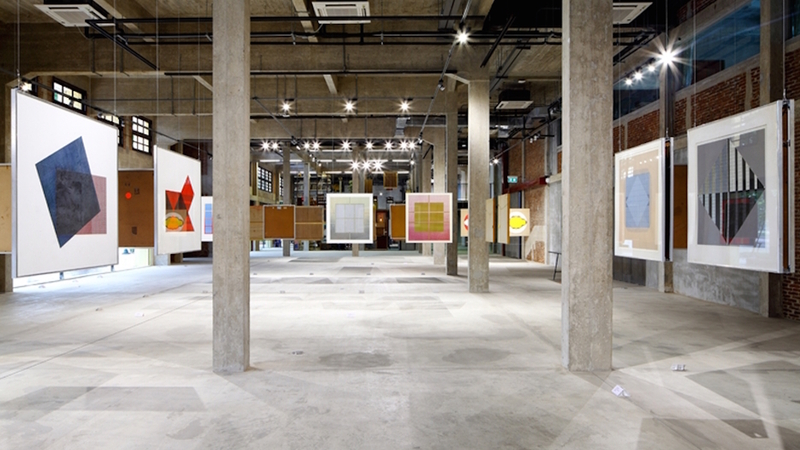 If you want to earn respect from locals, then you need to check out this list. Below, we’ll go over ten dos and don’ts every foreigner should know before booking his/her flight to Suvarnabhumi Airport. 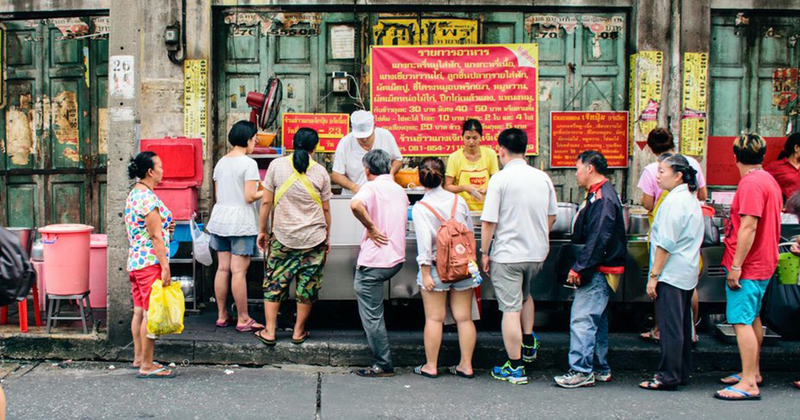 Trust us, you’ll save yourself a ton of embarrassment in Bangkok if take these tips seriously. Let’s be honest, Thai is an extremely challenging language for English speakers to master. Since Thai has no historical connection to the Romance languages, there are no cognates to help Westerners guess at another speaker’s meaning. Other challenging aspects of learning Thai include the exotic script and the tonal structure. How are you? : sabaai-dii rue? Do you speak English? : phuut phaasaa ang-krit dai mai? Where is the toilet? : hông nám yùu thîi năi? How much is this? : nîi thâo rài? Bonus tip: it’s a good idea to print out your hotel address in Thai script and put it in your wallet. You never know when you might need to show this to a taxi driver or ask a local how to get there. The Thai people like to express their patriotism twice a day by pausing and listening to the Thai National Anthem (aka Phleng Chat Thai). 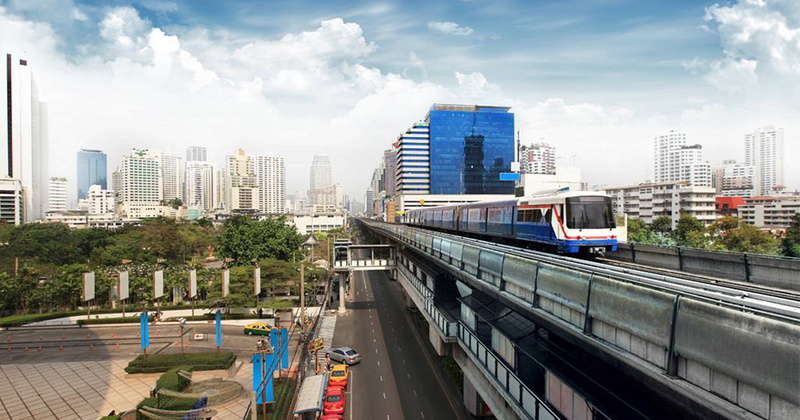 If you’re walking around in a public space, on the metro, or even watching TV at either 8AM or 6PM, you’ll hear the Thai National Anthem loud and clear. Even though you’re a foreigner, it’s considered extremely disrespectful if you don’t stop and pay your respects when this anthem plays in public. You’re also expected to stand whenever you hear the Thai King’s Royal Anthem (aka Sansoen Phra Barami). Usually you’ll hear Sansoen Phra Barami before a film or live show. As in many other Asian cultures, Thais always take off their shoes before entering a private home or a Buddhist temple. There are also a few restaurants and shops that require their guests to remove footwear, so be sure to read the signage and look around at other shop patrons before entering. One easy way for Westerners to get into this habit is to invest in shoes that are easy to take on and off. 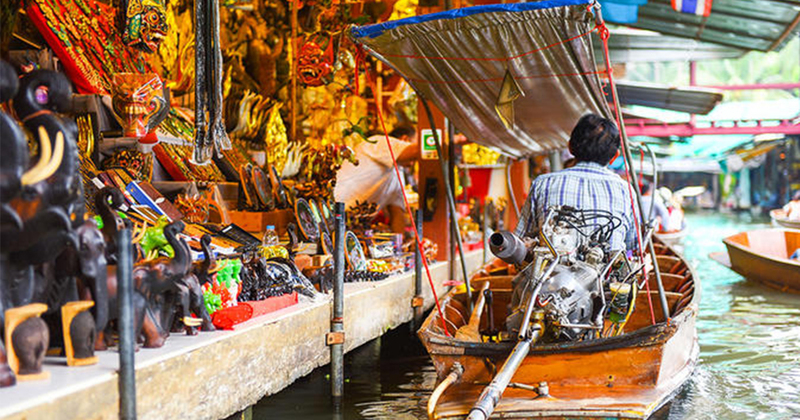 Consider using a pair of flip-flops or hiking sandals as your primary footwear while in Bangkok. While Bangkok fashion has loosened up considerably in recent years, you’ll get a lot farther with most locals if you wear decent clothing. Basically this means you should avoid revealing too much skin and steer clear of extremely tight clothes. 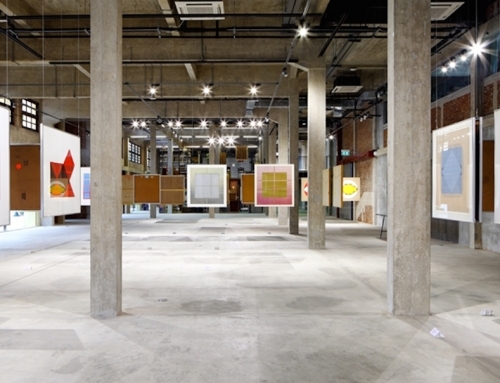 If possible, all clothes should be neat, clean, and free from excessive logos. While long pants are preferred, men could wear tasteful shorts so long as they’re not going inside a temple. Women should wear clothes that cover their shoulders, legs, and cleavage as much as possible. If you follow these commons sense dress rules, you’ll have no problems earning respect from most Thai locals. Almost 95 percent of Thais are devout Theravada Buddhists. One of the ways laymen and women express their faith and gratitude for the Buddhist monastic community is by offering food every morning in a ceremony known as pindapata. No matter what you believe, offering food to Buddhist monks is an unforgettable experience you should take part in at least once on your trip. Usually the Thai monks walk through Bangkok very early in the morning, so set your alarm for at least 5AM to get ready. Ask employees at your hotel where and when the monks tend to appear and what they recommend offering. 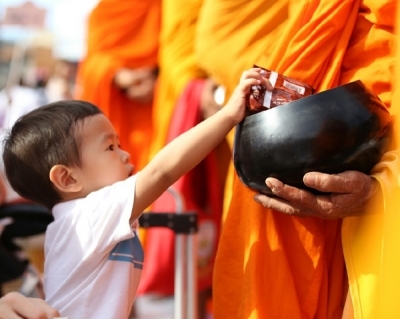 When the monks approach you, respectfully pour your offering into their bowl. If you’re a woman, you’ll have to either put the food in front of the monk or place it on a special towel so you don’t come in contact with the monk. As a part of their monastic training, Thai monks cannot lay a finger on a woman. Just so you know, it’s against the monastic rules for Thai monks to handle money. If a monk asks you for a financial donation, then you know he’s a sham monk trying to make a buck off of naïve tourists. Dissing the Thai Royal Family is a big no-no. Indeed, it’s illegal to say anything derogatory about the Royal Family while in Thailand. Believe it or not, you could face between 15 to 20 years behind bars if you’re caught saying anything negative about Thai royalty. This includes even symbolic gestures like ripping or stomping on Thai money that has a picture of the King or Queen on it. It’s also against the law to own a copy of The King and I or Anna and the King while in Thailand. 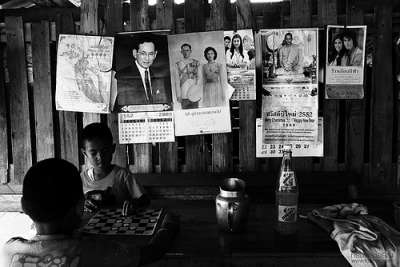 Locals feel these films are extremely disrespectful in their depiction of the noble Thai monarchy. No matter what time of year you’re visiting, you must remember to drink plenty of bottled water to stave off dehydration. This is especially true if you frequently drink dehydrating beverages like alcohol or coffee. You should aim to drink at least eight eight-ounce glasses of purified or spring water every day. While you might see locals drinking from the tap, it’s highly advised that foreigners rely on bottled water. 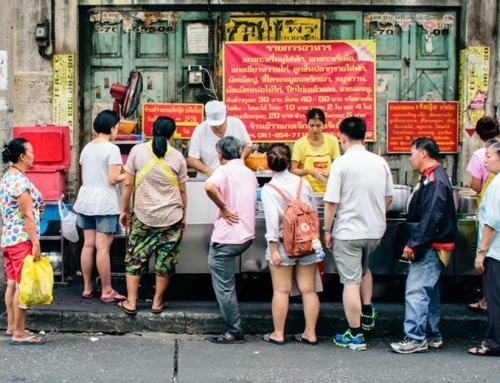 Most Thais have built up an immunity for local pathogens that could cause serious reactions in Westerners. In case you were wondering, the worst time to visit Bangkok in terms of heat is between March and June. Temperatures during this time of year frequently reach 104 degrees Fahrenheit. Pointing with your fingers or feet at people is considered rude in Thai culture. Indeed, the feet are considered the lowliest part of the body, so using your feet to point at someone is almost like swearing at them. Never point your feet towards other people or Buddhist statues under any circumstance. To get someone’s attention or indicate something, it’s better to use your chin than your fingers. We’d only advise you point to inanimate objects, menu items, or animals with your hands. If you are going to point to these things, however, then it’s considered more respectful to use your whole hand instead of one or two fingers. All taxis in Bangkok have meters installed so you won’t have to negotiate the fare at the end of your journey. There are, however, a few unscrupulous taxi drivers who will try to get more money from naïve tourists. Always be on the lookout for these dishonest cabbies, especially if you’re getting a cab from in front of your hotel. 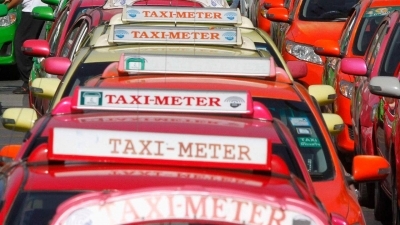 Before getting into a Bangkok taxi cab, ensure your driver has a meter and turns it on at the start of your trip. If s/he refuses to put on the meter or promises you a “fixed rate,” just walk away. In Western cultures, it’s not uncommon to innocently pat children on the head. By contrast, in Thailand this gesture is considered disrespectful. In Thai culture the head is considered the holiest part of the body, thus touching someone else’s head is seen as a major insult. Immediately apologize even if you inadvertently pat someone’s head or hair. Also, be careful never to walk over a person who is sleeping on the ground. Khao San Road has a famous (or perhaps infamous) reputation in Bangkok. 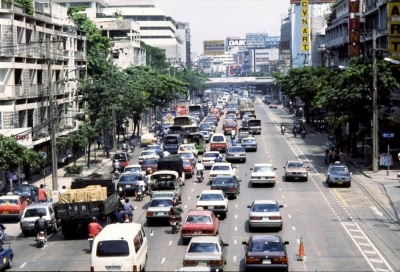 Located near the Royal Palace, this relatively short road is a favorite haunt for Western backpackers due to the high number of affordable hostels in the area. 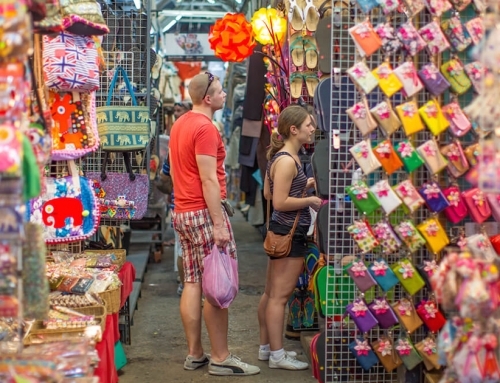 While it’s worthwhile to take a peek at Khao San Road if you have the time, you shouldn’t put this destination at the top of your tourist itinerary. 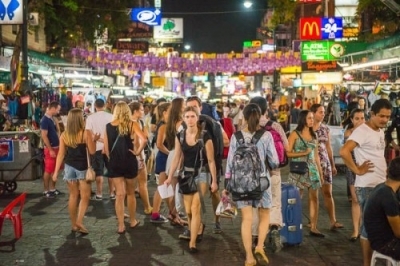 Khao San Road is often filled with drunks and foreigners, so you won’t get a great sense of authentic Thai culture here. 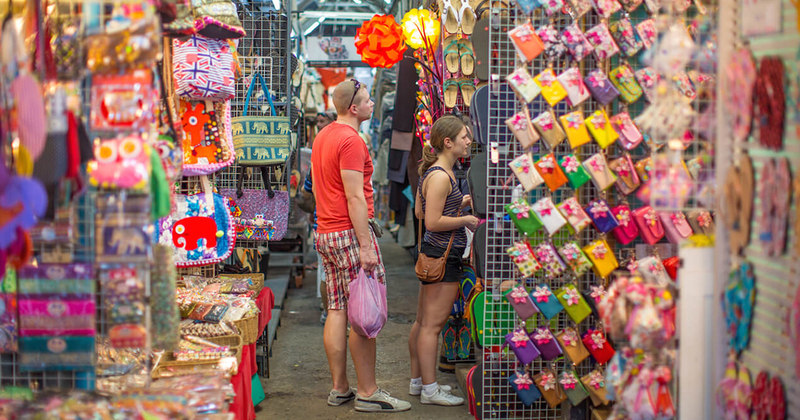 Some people even consider Khao San Road a bit of an eyesore. Unless you’re into the “bohemian” vibe, don’t plan on spending too much time here.